A "rezora-approved" stable of independent partners who can help our clients develop and deploy the brand-level strategies into which rezora should fit. What are Certified Marketing Partners? Since our founding in 2009, we've provided the services necessary for our clients to learn and leverage the power of the rezora platform. Such services come in numerous forms and include Training, Support, Marketing Services, Data Integration and others. Yet, we recognize that our clients compete in a complex marketing environment. For rezora to be utilized fully, it must be integrated into the larger marketing strategy and aligned with other major initiatives. 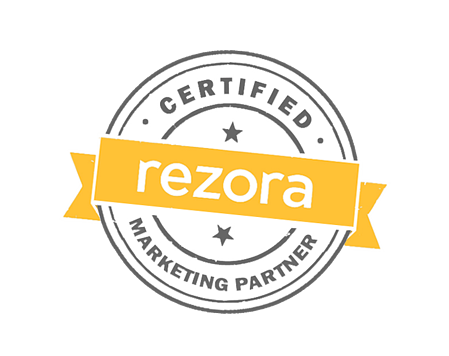 That's why we created the Certified Marketing Partner program, to provide our clients with a "rezora-approved" stable of independent partners who can help our clients develop and deploy the brand-level strategies into which rezora should fit. Need help picking the perfect partner? Drop us a line, we're happy to help!